This page explains the search functions in Omeka Classic on the public and admin side, and how to use them. If you are looking for information on how to manage search settings, please see that documentation. The simplest way to search an Omeka Classic installation is using the simple search bar. On the admin side, this is always present in the upper right hand area of the window, under the top navigation. The exact location of the search bar on the public side varies by theme, but is generally close to the navigation menu. To perform a basic search, type the keyword you want to search for in the field and either hit enter on your keyboard or click the Search (magnifying glass) button. 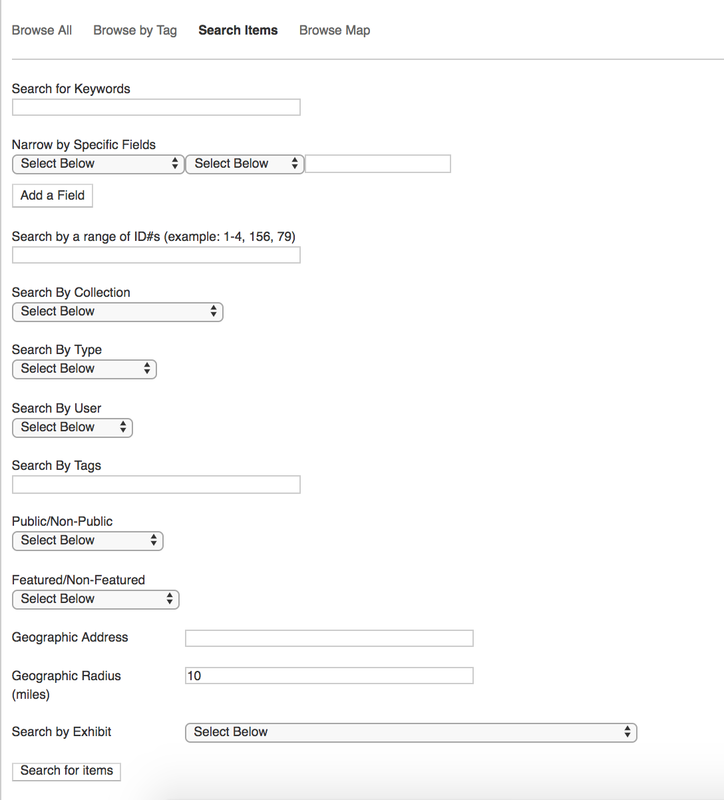 Depending on the search settings, content in this search might include item, file, and collection metadata, the text on simple pages, exhibit summary pages and exhibit pages. To access the options for the basic search, click on the ellipses (...) button to the right of the search bar, next to the search (magnifying glass) button. Exact match, which will only find exact matches to the word or phrase you enter. The “Search Items” page will load. It presents a variety of options for advanced searching across all items. You do not need to complete all fields, only as many as you want. select a field from the first dropdown. in the text area, enter the terms for the field search. You can add additional field searches using the green “add a field”. Additional field searches include a dropdown to select AND or OR for these terms. Use and to narrow the search, requiring it to find items which meet both field criteria. Use or to keep the search broad, finding items which meet either field criteria. Search by a range of item IDs: text field in which you can enter item IDs. You can describe a range, such as 1-7, or a sequence separated with commas, for example 1,5-7,11. Search by collection: dropdown of collections in your installation. Search by type: dropdown of existing item types. - Geographic Address: search for items at an address (text field) - Geographic Radius: proximity to the address given above, in miles. - Search by Exhibit: a dropdown of exhibits. This will find all items used in the specified exhibit. Seeing unpublished items when searching on the public side: If you are still logged in to your Omeka installation, you will see all items on the public and admin side. Try logging out or visiting the site in a different browser (where you are not logged in). MySQL by default does not index any words shorter than 4 letters long. 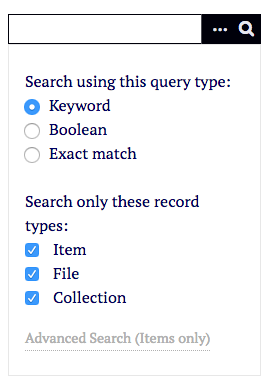 Exact match searches will look for the exact string given by the user, anywhere in the record. For example a search for 'poe' would also return 'poem'.